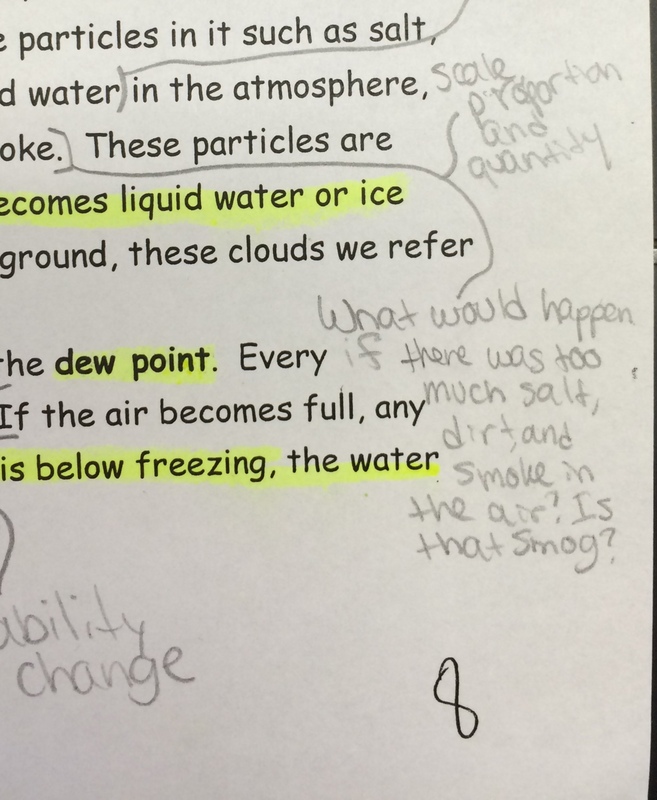 Students will be able to explain how the clouds and dew form. Students collect dew point data and create clouds inside of a bottle as they explore how energy drives the cycling of water on earth! Developing and Using Models Develop and/or use a model to generate data to test ideas about phenomena in natural or designed systems, including those representing inputs and outputs, and those at unobservable scales. Flows, Cycles, and Conservation: Tracking energy and matter flows, into, out of, and within systems helps one understand their system’s behavior. I begin every class by asking the students "What are you going to learn today?". 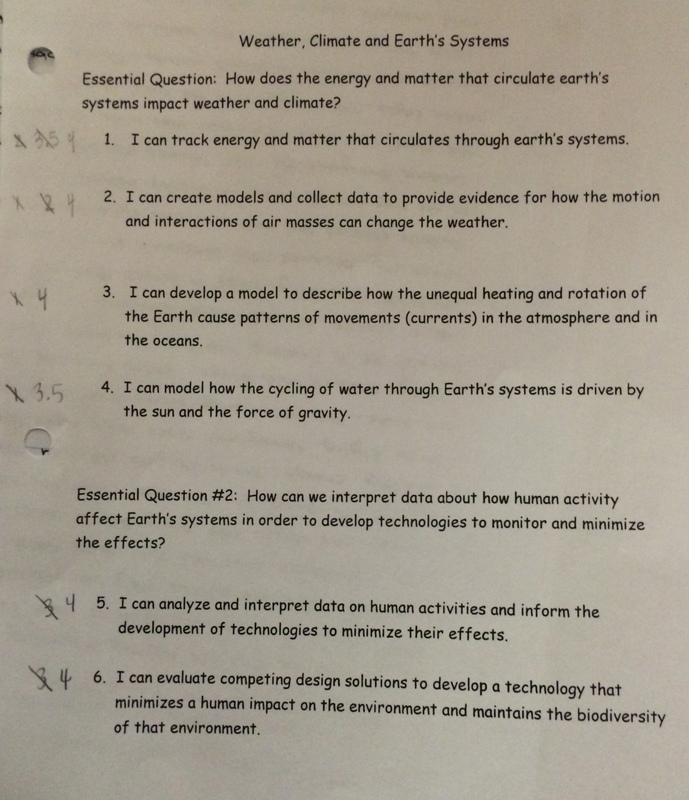 Students respond by referring to the Essential Question, "How can I demonstrate science and engineering literacy?". This EQ is included on their Unit Plan and on the front board. Provide students with the Clouds, Humidity and Dew Point Reading. To start, I only have students read the front side of the article (we come back to address the back later in the lesson) and climb the Ladder of Discourse. The Ladder of Discourse is a strategy I use in my class to help students think critically as they read. For middle school students, informational reading can just become words on a page. The Ladder of Discourse is a way to help students recognize what they should be thinking about as they read so that they can gain an understanding of the text. The levels of the Ladder of Discourse are "Tweets" (text to self connections), "Huh? 's" (questions or concepts they do not understand), "Found It" (finding answers to questions through context clues or finding science answers), and "Discourse" (combining ideas to think beyond the text). The resource Ladder of Discourse: Description of Rungs provides background about the "rungs" students use when reading. For middle school students, thinking critically during reading is a challenging task. However, being able to think beyond the text is key to real understanding of scientific concepts. This "thinking beyond the text" is what we call the rung "Discourse". I have found that the NGSS has provided us with an invaluable tool in the Crosscutting Concepts. These provide students with themes that can guide their critical thinking. When they read, students have out their Ladder of Discourse: Description of Rungs document so that they have a description of the Crosscutting Concepts next to them with the CCCs fresh in their mind. As they read, they try to make connections to the CCCs. This could be in the form of a statement, idea for an experiment, a prediction, or a question. In order to do this, students have to slow down when they read. Every 2 - 3 sentences they stop and think about what connections they are making to the text and they document their thinking by "talking to the text". I have found that with the implementation of this strategy, my students depth of understanding from reading has dramatically increased. As students read, they "talk to the text", to document what they are thinking. Below are just a couple of examples of connections that students made to the NGSS Crosscutting Concepts. Students then complete two lab stations dealing with dew point and cloud formation. Provide students with the Dew the Dew! Lab Sheet. Emphasize to students that they must read the procedures carefully and that they must wear goggles at the "All Bottled Up" station. 1. Fill the can about halfway with room-temperature water. Make sure the outside of the can is dry. 2. 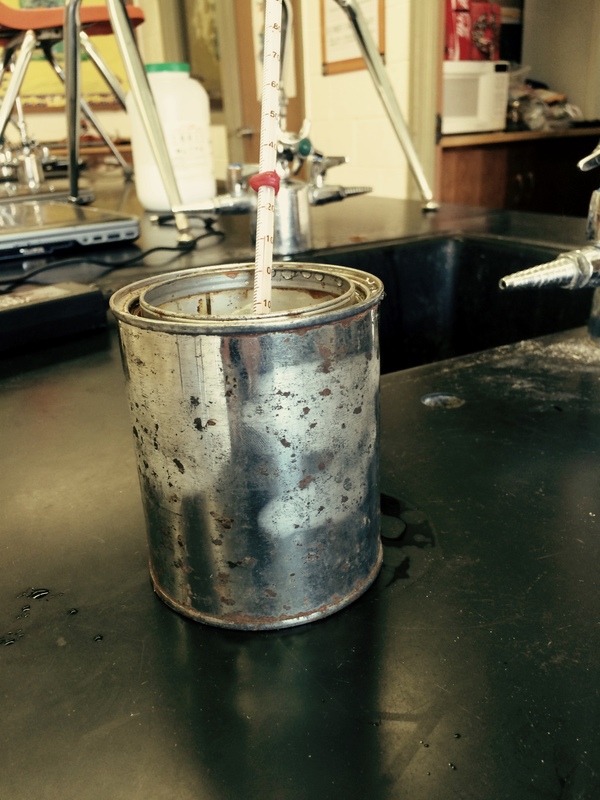 Place the thermometer in the can and record the temperature. Leave the thermometer in the can. 3. Add a few ice cubes and stir. Carefully watch the outside of the can for “sweat” drops to form. When they do, record the temperature. This is the dew point temperature. 4. Repeat steps 1-3 outside the door. **Teacher Tip: Show students what they are looking for. 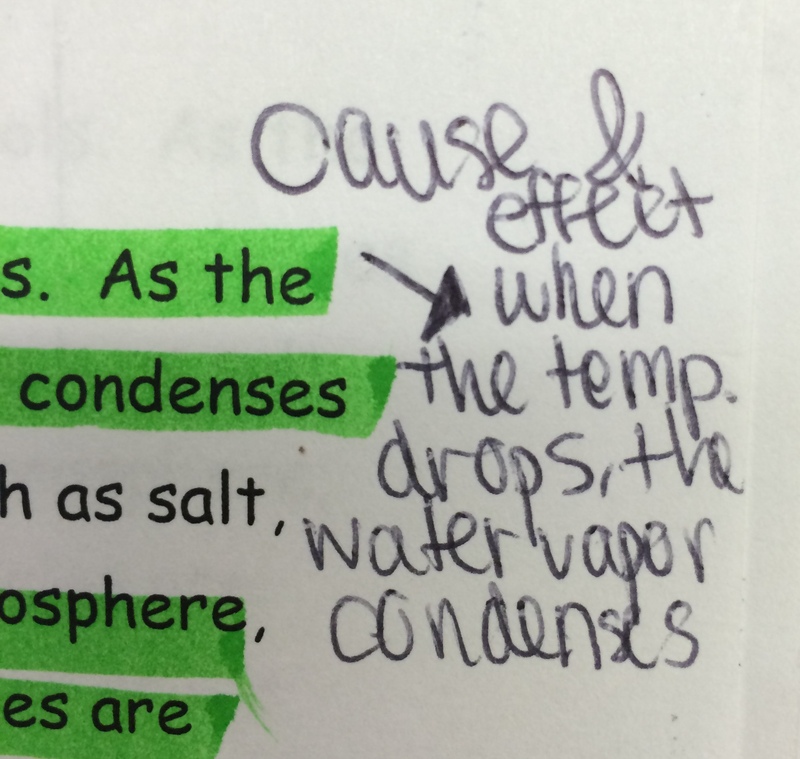 Students have a hard time recognizing the first condensation. Many students spend time looking for actual droplets of water when the first sign of condensation may just be "cloudiness" that you can see in the picture above. Your data may be different than the student's below. Students should recognize that the dew point outside is different than inside and include their reasoning for this difference. 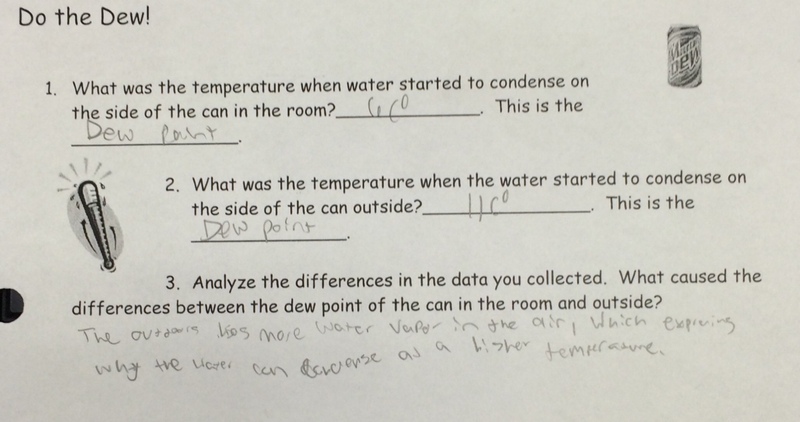 The student below explains that the dew point outside was at a higher temperature than inside because there was more water vapor in the air outside than inside the classroom. 1. Fill the 2-liter bottle one-third of warm water and place the cap on. 2. Squeeze and release the bottle and observe what happens. If the inside of the bottle becomes covered with water droplets, just shake the bottle to get rid of them. 3. Take the cap off the bottle. Light a match (Wearing goggles of course!) and hold the match near the opening of the bottle. 4. Drop the match in the bottle and quickly put on the cap. Make sure you trap the smoke inside the bottle. 5. Slowly squeeze the bottle hard and release. Observe. 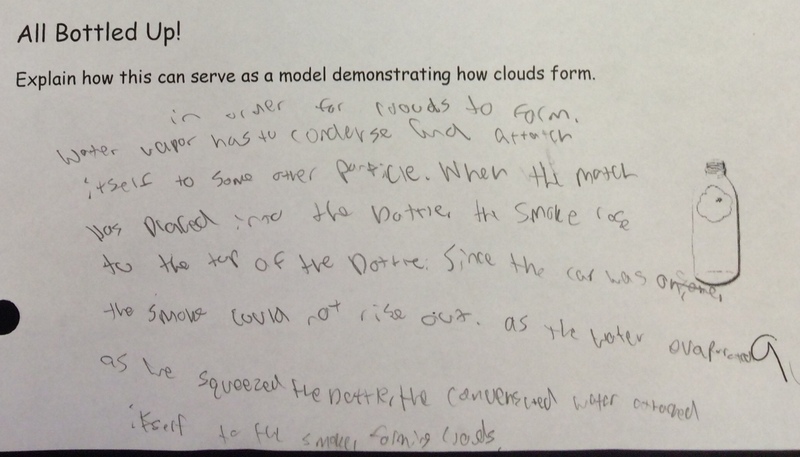 The student below explains that in order for clouds to form, water vapor has to condense and attach itself to a solid particle. He explains that when the match was placed in the bottle, smoke rose to the top. He further explains that when the bottle was squeezed and released, the water evaporated, rose, and condensed on those smoke particles, forming a cloud. To close class, I read short excerpts from the book Holes by Louis Sachar. This young adult novel is thought of fondly by my students and the majority have read the book or watched the movie. I read a short excerpt that starts at the bottom of page 31 and ends on the back of page 32. This excerpt describes how the camp the main character is living at is in a desert wasteland near a mountain. Next I read Chapter 37 and 38 (really short - about 1 -2 pages each.). These pages describe how Stanley (the main character) climbs the mountain to find a wet, lush grassland on the other side of the mountain. 1. After learning about cloud formation and dew point, why do you think God's Thumb was always cloudy, rainy, and wet? Answer: When the wind hits a mountain, it rises. As the moist air rises, it cools. 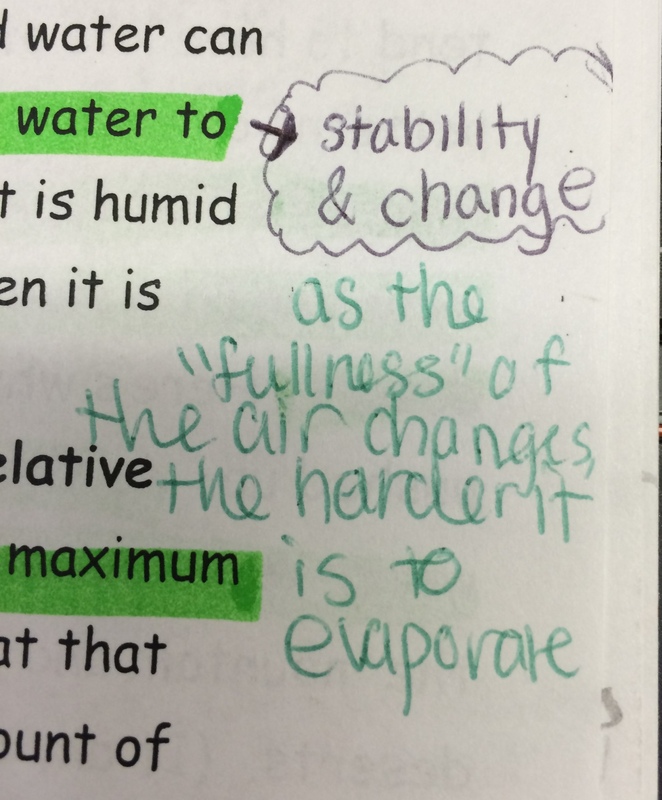 Cool air holds less water vapor and so the water vapor condenses and rains! 2. What side of the mountain was the camp? God's Thumb (The wetland)? Windward or leeward? Answer: The camp was on the leeward side of the mountain while God's Thumb was on the windward side of the mountain. To reinforce this idea, I then have the students flip to the second page of the reading they began at the beginning of the lesson and look at the picture of the windward and leeward sides of the mountain that is included there so that they can get a visual of this phenomena. 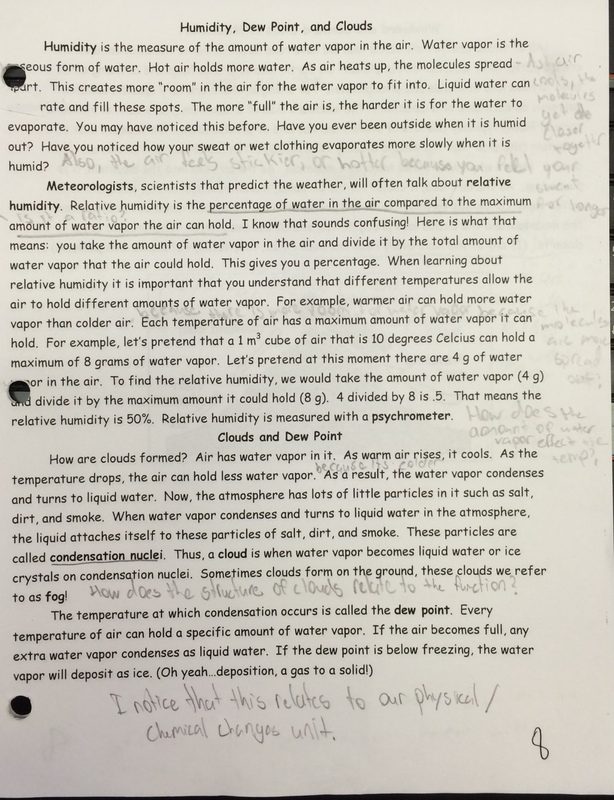 Eliciting Student Ideas: What is Air? What is a Gas?